My name is Jimmy, Hajime Komaba, working at Enterprise Support Group of JPCERT/CC, a department which takes care of Nippon CSIRT Association (NCA), a community of various enterprise and organizational CSIRTs in Japan) and Council of Anti-Phishing Japan (APC). It’s been quite a while ago, but last November, I was given an opportunity to travel to the Republic of Congo with my colleague, Koichiro (Sparky) Komiyama. Today, I would like to share the experience from my first trip to Africa and about AfricaCERT’s event. AfricaCERT is a forum of CSIRTs in Africa, with the aim of promoting cybersecurity on the Continent. One of their key activities is the trainings and lectures for their members. Last year, one of the trainings and lectures took place in Pointe Noire, the Republic of Congo, from 28th November to 1st December. JPCERT/CC, a supporting member of AfricaCERT, was invited as a trainer for the programs planned for the first two days. The sessions consisted of a lecture about CSIRTs in Japan, such as activities of NCA, followed by some hands-on trainings. Our sessions attracted about 28 trainees from various African countries including Cote d’Ivoire, Chad, Angola, Guinea, etc. The participants were engaged in cyber security missions as air traffic controllers, telecom company officials, and so on. For the sessions on the later days, CERT-FR from France, also a supporting member of AfricaCERT, was also invited as a trainer. I was an assistant for this session, while Sparky was the main trainer. When he started talking about the various CSIRTs in Japan, the participants seemed to be interested in the topic at once. Lately in Africa, “CSIRT” is one of the hot topics, and there are many companies and organizations that are interested in launching one. Serving as the Secretariat for NCA, JPCERT/CC introduced its organization overview and activities. This included the fact that NCA’s members now count up to more than 100 teams (and more to come in 2016), which is almost double from 2014. The participants were surprised at this number. As well as aiming to support organizations who wish to launch a new CSIRT, NCA also has diverse Working Groups in order to provide opportunities for teams to exchange information on CSIRT operation, incident case studies and latest cyber threats. The next program was a hands-on session, mainly for log management using SSH server. Sparky and I introduced how to collect and sort information from a vast amount of log data using shell commands. The participants were engaged in each task enthusiastically. This picture above was taken while I was teaching how to use those commands and confirm the results. 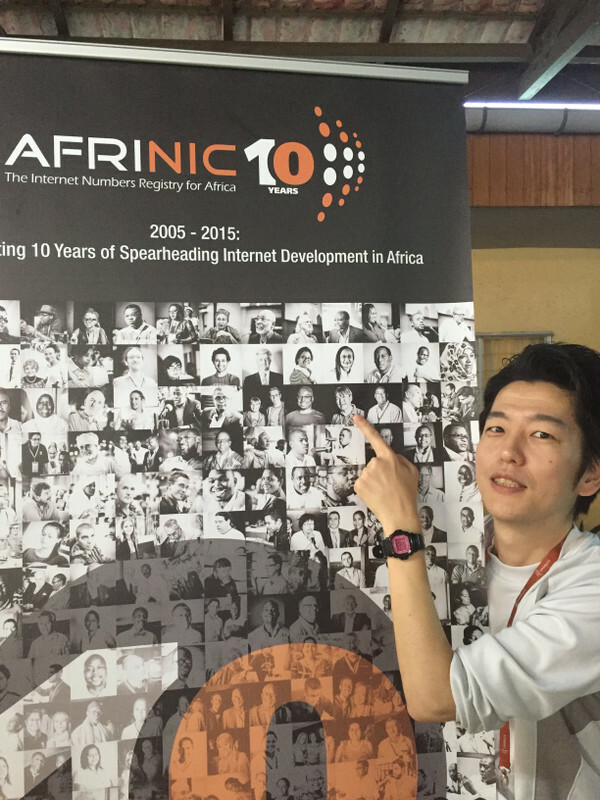 At the event, we found this banner (above) with the pictures of key persons who have assisted in spearheading Internet in Africa. 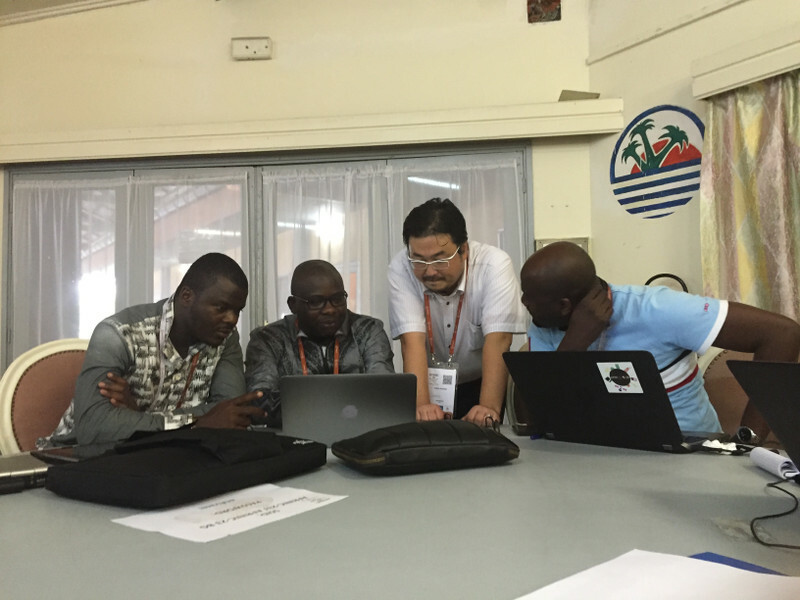 This is Sparky pointing the picture of Dr. Suguru Yamaguchi1, a member of JPCERT/CC’s Board of Directors, and one of the initiators and a contributor of AfricaCERT. Of course, having travelled to Africa more than 12 times now, Sparky’s photo was on the banner as well. What impressed me during the training were the bright and enthusiastic eyes of the participants. I felt that each attendee was actively engaged in each task and trying to make the most of the training. As a trainer, I also enjoyed conducting the training to such participants, and I recall those moments every now and then. Various different trainings and events by AfricaCERT will keep going. I hope to return to Africa in the near future if any opportunity arises. In order to provide continuous assistance in CSIRT development in Africa, JPCERT/CC will continue such activities by making more visits. I will never forget those bright eyes of the participants in the Republic of Congo, and will work on my projects here at JPCERT/CC until my next return. 1We are deeply saddened to announce that Dr. Suguru Yamaguchi, a member of the Board of Directors of JPCERT/CC, passed away on May 9, 2016. Prior to engaging in support secretariat work for sales and distribution partners with foreign security vendors. In July 2014, I joined the JPCERT/CC Enterprise Support Group. I am in charge of secretariat of the Council of Anti-Phishing Japan operated by JPCERT/CC as Security Analyst, and secretariat of Nippon CSIRT Association. Phishing countermeeting council engages in analysis of domestic and foreign phishing cases, requests for suspension of phishing sites, response to inquiries, etc. Also attending educational activities such as lectures at conferences such as the APWG (Anti-Phishing Working Group) in the United States.